Glass is a non-crystalline amorphous solid that is often transparent and has widespread practical, technological, and decorative usage in, for example, window panes, tableware, and optoelectronics. The most familiar, and historically the oldest, types of glass are “silicate glasses” based on the chemical compound silica (silicon dioxide, or quartz), the primary constituent of sand. 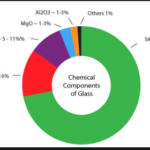 Of the many silica-based glasses that exist, ordinary glazing and container glass is formed from a specific type called soda-lime glass, composed of approximately 75% silicon dioxide (SiO2), sodium oxide (Na2O) from sodium carbonate (Na2CO3), calcium oxide, also called lime (CaO), and several minor additives. Architectural glass is glass that is used as a building material. It is most typically used as transparent glazing material in the building envelope, including windows in the external walls. Borosilicate glass is a type of glass with silica and boron trioxide as the main glass-forming constituents. Borosilicate glasses are known for having very low coefficients of thermal expansion , making them resistant to thermal shock, more so than any other common glass.